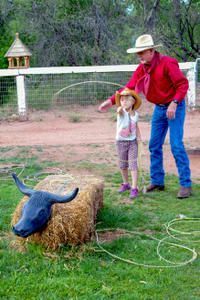 Take the younger generation on the Excursion with Kids in Sedona, providing you and the family with a full three nights’ lodging in the beautiful Sedona, Arizona as well as the Chuck Wagon Supper and Western Stage Show at Blazin' M Ranch. 3 Nights’ Lodging in your choice of over 26 hotels. With the Chuck Wagon Supper and Western Stage Show at Blazin' M Ranch, guests are sure to have a fantastic time. Once the chow bell rings, guests will be able to feast upon a wagon-style meal featuring BBQ chicken, a baked potato, cowboy beans, and more. Paired with entertainment from the amazing Blazin' M Cowboys, this activity is sure to be a favorite. Take your pick of over 18 incredible hotels to return to after your long, Grand Canyon-filled day! Whether you want to come back to a room with an incredible view or a cozy room to relax in, you're sure to find just what you and your family needs after a day full of adventure in Sedona, Arizona. You won't want to miss out on all of the incredible opportunities in Sedona, Arizona so book your tickets today for the Excursion with Kids in Sedona!